Drying of fruit and vegetables | Infonet Biovision Home. Drying of agricultural products is the oldest and widely used preservation method. Drying aims at reducing the water content as much as possible to stop microbial activities and deterioration. Moisture left in the dried foods varies between 2-30% depending on the type of food. In tropical countries, solar dryers can be used to dry fresh produce when average relative humidity is below 50% during drying period. Drying lowers weights and volume of the product hence lowers costs in transportation and storage. However, drying also lowers nutritional value of the product e.g. through loss of vitamin C. Drying can lead to changes of colour and appearance that might not be desirable. Fruits like mangoes, pawpaws, guavas and bananas can easily be dried. However, they should be harvested at the right maturity stage and ripeness. Hard ripe stage in mangoes, pawpaws and bananas gives best results. Avoid overripe or underripe fruits in order to obtain good products. To prepare the fruits for drying, wash them thoroughly with clean water. The fruits are peeled if necessary and cut into smaller uniform pieces to ensure faster drying. Stainless steel knives are recommended for peeling and cutting of the slices or pieces. To avoid discolouration and excessive vitamin losses, treatment with anti-oxidants with low pH (acidic) like citrus (lemon or lime) juice is done. Fruits like pineapples may require pre-cooking to soften fibrous tissue hence hasten drying. Drying is done on trays, which should be made of wood, fabric, plastic or sisal material. This is because metal materials may affect the drying product negatively e.g. copper destroys vitamin C, iron rusts, aluminium discolours fruits and corrodes. Most fruits have natural acids and sugars which are preservatives therefore moisture content of about 20% i.e. leathery and springy dry (not brittle) is good for storage. This is however dependent on the fruit or vegetable. After the correct stage of dryness is achieved the product should be removed from the dryer parked and stored in a dry, dark store. Vegetables like tomatoes, kales, cowpeas leaves, cabbages and pumpkin leaves can be dried. Tender healthy vegetables are selected for drying. To prepare the vegetables for drying, wash and remove old and damaged parts and then chop/slice for drying. 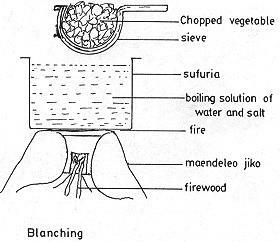 A solution of water and salt is prepared (varying in strength depending on products) and boiled. The vegetables for drying are dipped into the hot boiled saline solution in a piece of clean cloth (or basket). Kale, other hard leafy vegetables and cabbages should be dipped in the hot boiling solution for 3 minutes while spinach and soft leafy vegetables require only 2 minutes. To avoid overcooking, boil the blanching water before dipping the vegetables. Dip the vegetables in cold water immediately after removing them from the boiled saline solution to prevent further cooking. After blanching the vegetables are spread on trays and dried, then parked and stored in dry, dark store. Blanching is carried out to improve the quality by inactivating the enzymes, reducing the microorganisms, softening the vegetables, and preserve the natural colour of the green vegetables when they are dried. NB: Some spices like garlic, coriander (dhania) and parsley should not be blanched. This is a rectangular shaped box dryer with two chambers i.e. heating chamber and a drying chamber. It has been used at farm-household level to dry green vegetables with success. The dryer can be easily carried from place to place. 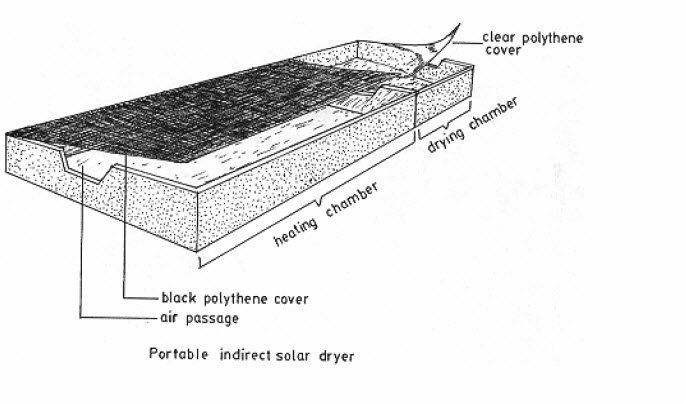 The heating chamber has a clear polythene top while the drying chamber has a black polythene top. Airflow is free through the heating chamber to the drying chamber. Also a rectangular shaped box dryer with two chamber for heating and drying respectively. The two chambers have clear glass tops. The dryer is also painted black for better heat absorption. The drying chamber has movable trays that can be removed, loaded on to the chamber and shifted during drying. The shifting of trays ensures even drying. Over heating during drying is controlled by increasing ventilation by opening the rear window of the dryer. For better drying the dryer is rotated on its stand to facethe direction of the sun. Food products are prone to contamination, which can affect the health of consumers. To have a good processed product, standards of hygiene must be followed and maintained during preparation, processing and storage. Avoid rings, bangles and nail polish during processing. Wash hands carefully with soap and running water. Do not be involved in processing when you are sick and/or when having open wounds. Maintain personal cleanliness including body and clothes. Scrub wooden equipment, e.g. 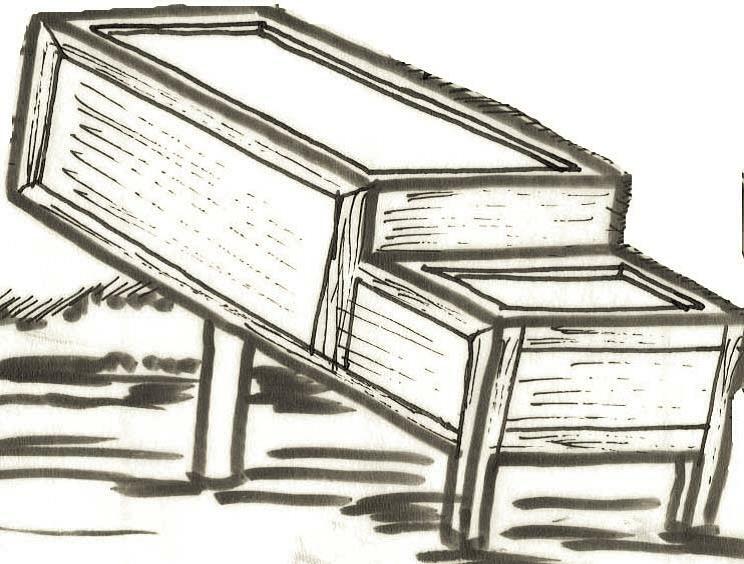 tables and benches, with soap water and brushes and then rinse thoroughly. 1. Select and weigh hard ripe fresh mangoes. 2. Wash the fruits thoroughly in clean water. 4. Slice the peeled fruits into thin uniform slices. 5. Prepare lemon juice/water solution in the ratio of 1 part lemon juice to 20 parts of water. 6. Deep the mango slices in this solution then arrange them on the trays (in single layers). 7. Load the trays in the dryer (the dryer should be facing the sun). 8. Shift the trays in the dryer occasionally until the slices are dry. 9. Unload the dryer for sorting and packaging of the dried slices. 10. Pack the dried slices into moisture proof containers and store in a cool, dry dark place. 2. Cut thin longitudinal slices. 3. Dip the slices in the diluted lemon juice (1 part lemon juice: 20 parts water). This step can be avoided if product is meant for young children. 4. Arrange the slices in single layers on the trays. 5. Load the trays into the dryer. 6. Shift the trays occasionally until the slices are dry. 8. Pack the dried bananas into moisture proof containers and store in a cool, dark place. Integrating of Tree Crops into Farming System project (ITFSP). Training manuals.